Wow, that was quick! Many thanks to Ulli who solved the case of the mystery radio we posted yesterday. The radio was a giveaway about 1995. 1 IC Sony CXA1191S 314J22V , 5 Transistors , 3 -band filter , 5.5 cm speakers , 8ohm , 0.5 W.
Today’s AA batteries are a bit too long, the 3 AA not quite fit into the battery tray . The display with the time can be tilted . ART No. 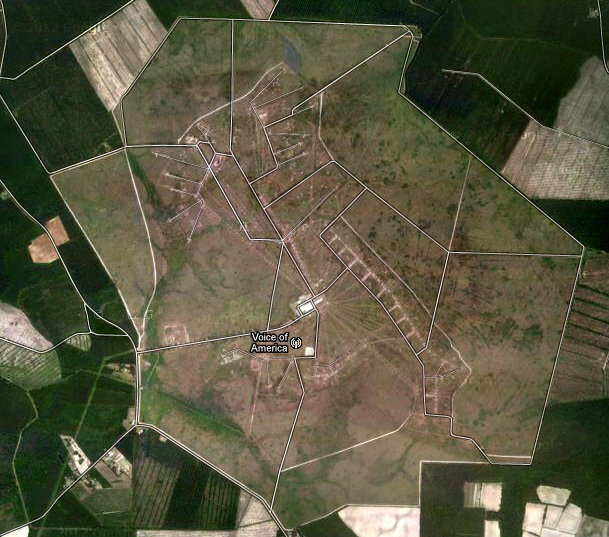 05796-07 , CENTRON LABORATORIES LTD . This entry was posted in AM, News, Radios and tagged AM, FM, Mystery radio, Radios on July 30, 2013 by Thomas. Can you identify this mystery AM/FM radio? 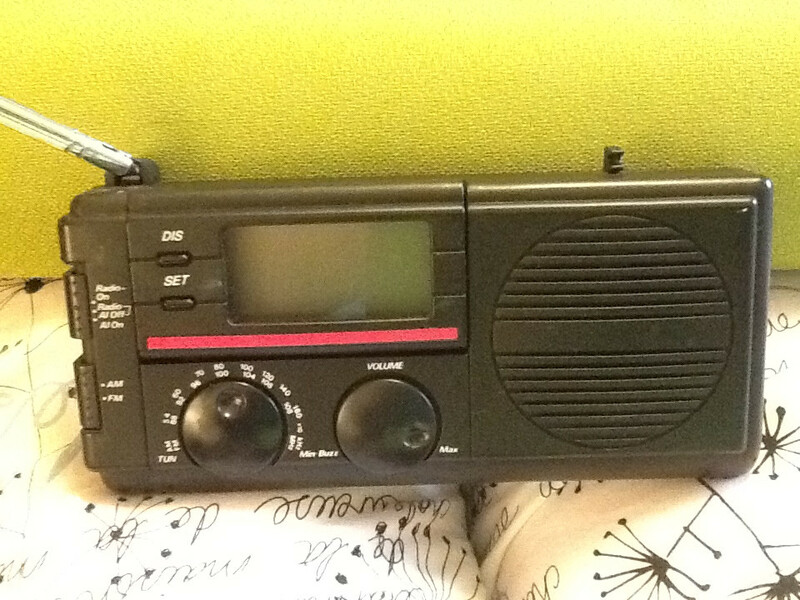 If you can identify this radio for SWLing Post reader, Paul, please comment below. This entry was posted in AM, News, Radios and tagged AM, FM, Mystery radio, Radios on July 29, 2013 by Thomas. While countries like Canada are preparing to tear down their state-of-the-art transmission site, Taiwan appears to be investing in theirs. Thanks to Andrea Borgnino for sharing a press release from the Swiss manufacturer, Ampegon, who has been contracted by RTI to upgrade two shortwave radio transmission sites in Taiwan. The transmitters are manufactured in Turgi, Switzerland while the antennas are designed in and delivered from Schifferstadt, Germany. At the first site near Taipeh four transmitters and two antennas will be installed, at the second site six transmitters and ten antennas. 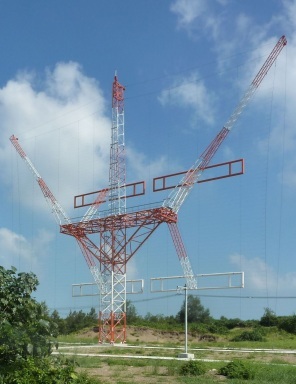 The new infrastructure is partially on air since May 2013 with two most modern transmitters and antennas and planned to be completed in several steps until autumn 2014. Chi-Ming Wang, Director Engineering at RTI, is extremely satisfied with Ampegon as partner for the project: “Ampegon is very experienced and has delivered shortwave transmitters for us thirty years ago that still work to our full satisfaction. Ampegon offers a complete solution approach including transmitters, antennas, control systems and DRM integration. In addition Ampegon provides the best price/performance ratio”. Significant benefit for the customer is a reduction in energy consumption by replacing the old equipment which leads to operation at higher efficiency rates. Savings in other operational costs are reached by a fully automated transmitter based on StationMaster Plus control system and because of a decrease in the amount of spare parts due to the market leading technology selected. The challenges of this project are short delivery periods and the management of local logistics including building and feeder line modifications, while keeping existing old transmitters and antennas on air. This is the largest contract for Ampegon since execution of the name change in November 2012. It means a significant factory load through 2014 for the locations Turgi and Schifferstadt. The project highlights that AM / DRM radio broadcasting keeps its important role in Asia and other areas of the world. Radio Taiwan International is obviously not pulling out of shortwave. Neither is neighboring China Radio International. Note that RTI is not the only Taiwan-based broadcaster investing in shortwave radio; PCJ International has recently completed a series of test broadcasts from their new (still under construction) transmitting station. This entry was posted in Broadcasters, Manufacturers, News, Shortwave Radio and tagged Ampegon, PCJ, PCJ International, Radio Taiwan International, RTI on July 29, 2013 by Thomas. Thanks to efforts by Broadcasting Board of Governors (BBG) member Victor Ashe, support of his board colleagues Susan McCue and Michael Meehan, and intervention from North Carolina congressmen G.K. Butterfield (D-NC) and Walter B. Jones (R-NC), the Edward R. Murrow Transmitting Station in Greenville, NC appears to be safe for now from budget cuts previously sought by officials of BBG’s International Broadcasting Bureau (IBB). In a letter to both congressmen, IBB Director Richard Lobo assured them that the Office of Cuba Broadcasting (OCB), which utilizes more than 80 percent of the scheduled shortwave transmissions from the Murrow Station, will work with the State Department and the U.S. Agency for International Development (USAID) to utilize $50 million of existing democracy and human rights un-obligated funds to pay some of the costs of the station’s operations. IBB Director Lobo assured both congressmen that under this proposal there will be no personnel changes at the Murrow Station and the employees would remain on the payroll of the International Broadcasting Bureau. But with Victor Ashe expected to leave his post on the board soon. With new BBG members expected to be confirmed, long-term future of the Murrow Station is still not certain. Ashe and Congressmen G.K. Butterfield and Walter B. Jones worked hard to keep it open despite pressure and resistance from IBB executives who wanted to close it down. The station is the only BBG shortwave transmitting facility on American territory fully controlled by the U.S. government. Let’s hope the new BBG board members understand the importance of keeping at least one BBG shortwave transmitting on US soil. In my opinion, every country should do this; not only for diplomatic and free press reasons, but for reasons of national security. In an emergency, if other communications systems were to fail, shortwave radio could still cover a vast broadcasting footprint–even the whole of the US. This entry was posted in Broadcasters, News, Shortwave Radio, What's On Shortwave and tagged Tour of Edward R. Murrow Transmitting Station, VOA, VOA Greenville, VOA Site B on July 27, 2013 by Thomas. Many thanks to Dave for sharing this excellent radio documentary from the BBC World Service show, The Fifth Floor. In this brief report, reporter Brian Hongwe clearly explains why police are seizing shortwave radios and arresting those who own them in the run up to the Zimbabwe elections. Click here (or use the embedded player below) to listen to this short segment or listen to the entire program–definitely worth it!– on The Fifth Floor’s web page. This post has been tagged in our ever-growing collection labeled: Why Shortwave Radio? This entry was posted in Broadcasters, News, Radios, Shortwave Radio, What's On Shortwave and tagged BBC World Service, Shortwave Radio, The Fifth Floor, Why Shortwave Radio, Zimbabwe, Zimbabwe Elections on July 27, 2013 by Thomas.